Looks like Greddy has recently released a new and improved version of there already successful Twin Turbo Kit for the Nissan 350z. The previous kit was initially only designed for the the VQ35DE motor that came in 2003-2006 Z cars. This latest kit now has an application for the VQ35HR motors that come in the 07-08 models. They have also added additional things to the kit here and there and taken away some as well. I love that they have upgraded to 20g turbos from the 18gs that were in the older kits. There is currently a promotion being ran with this kit. If you purchase any one of the new kits before October 31st, 2008 you will receive a free Greddy Ti-C Exhaust and a free case of GR-1 Full Synthetic Oil. Give us a shout if you would like to order one of these kits for your 350z. Click the link below to view the press release. I jacked these pictures from Shaun’s photo album a minute ago and I felt like posting them up today. Shaun was the one who took these pictures as far as I know, but that is about all the information I have on this G35. I’ll let the pictures speak for themselves. This thing looks serious business! Endless Swivel Steel brake lines are now available for the R35 GTR! Endless brake lines are steel braided and feature a carbon casing to protect against debris. Swivel heads help to prevent binding and aid installation. All Endless brake lines are in compliance with JIS standards. View our contact information at the link above to inquire about pricing or to place your order. Now I look at the word zealous and for some strange reason I see a portmanteau. I see the two words zeal and jealous being combined to make up the word zealous. Therefore my personal definition of zealous would be to be jealous of one’s Zeals. Maybe its because jealousy is the first emotion that I feel when I see someone with a new set of Zeal coilovers and hence I am zealous by my own definition of the word. Yup! I think that explains it. Well the reason why I am feeling “zealous” today is because one of our good customers, Larry, just received his set of Zeal Function A coilovers that we set him up with for his 350z and they look amazing. Good luck Larry and enjoy! These coilovers are so fly! After examining them I can say that they are noticeably different in construction that any other coilover I have seen for the Z. The spring is not mounted to the top of the shock. It is remote mounted, and there is no rubber bushing between the shock and the mount, It has a spherical bearing. The adjustment knobs have windows so you can see what setting you are using. The rears have aluminum lower mounts, but the fronts have steel. The brake line brackets, and the ABS wheel speed sensor mounting brakets are welded on and not an afterthought or left off completely. The dust boots are also safety wired on liek they should be so no dirt actually gets in there. The shocks were dyno’d and the graphs look very nice! By now many 350Z/G35 owners know how poor the stock endlinks deal with stiffer than stock swaybars. We’ve even seen customer cars where the stock endlinks have bent, and/or the bushings have worn when using only stock sways. When you start hearing creaking over small bumps, popping noises, etc, that’s usually a surefire sign that the endlinks are shot. I was among the first to report this issue on my own Z, and started development work on our own links in 2007. In doing the research, I acquired all the known aftermarket endlinks that I could find from Whiteline, SPL, as well as few units made by independant suspensions shops on their own. While each design was certainly beefier than stock, it was clear that they all were going to eventually wear and make noise due to the type of design they were using. We had used similarly designed links on other cars before, and knew there had to be a better way. One of the links we acquired as part of our research came out of a small company in Michigan called Powergrid. The owner had a long standing reputation in suspension engineering for such prominent firms as Roush Racing, and had come up with a design that combined OEM reliability, with full adjustability. They were nothing short of amazing. I used these on my own car for about 6 months before deciding to offer them to our client base. Now we’re the exclusive dealer for the Z/G application. Powergrid Endlinks 350Z/G35 - Click for More Info! These links use a genuine THK ball link end joing. Each THK Ball Link is composed of a high-precision ball bearing, a die-cast holder, and a shank connected to the ball by a special welding method. Through a unique production process, the mirror surface of the ball bearing is copied onto the inner mounting surface for perfect contact between them, achieving outstanding wear resistance, exceedingly smooth motion, and high strength. Unlike the other, more common heim joint style units, these are fully sealed, never require greasing, and are completely water tight and dust tight. In addition, you never have to worry about these links developing noise issues down the road due to the design of their ball joint ends. The dual lock nuts on either end of the link means that the length of the link will not change over time, which can happen on other style endlinks which only use 1 lock nut. 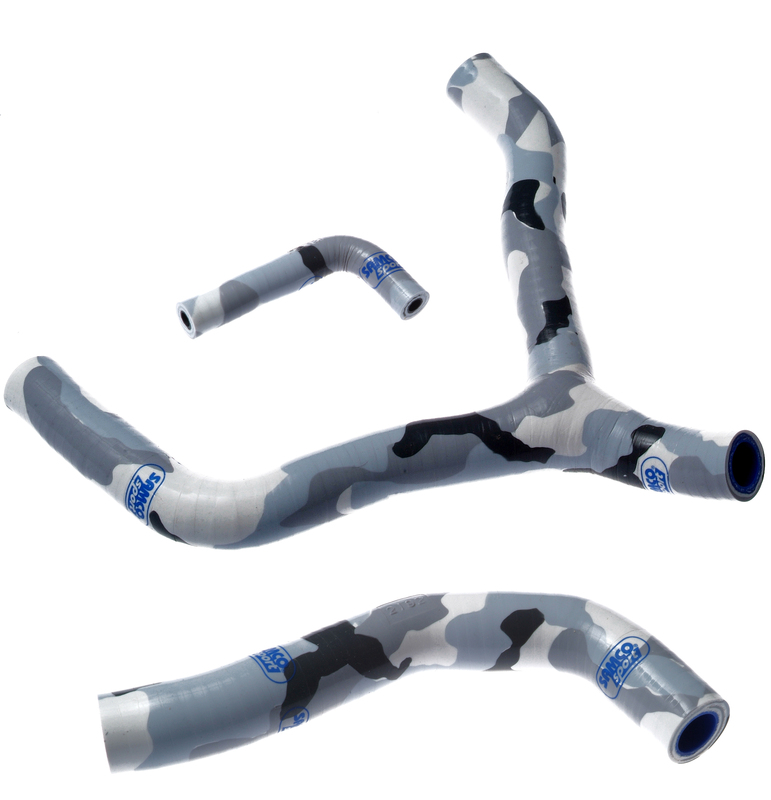 In addition, the other style links on the market are not sealed units, so dust, grime, sand, and moisture is ever present, and leads to increased NVH (noise, vibration and harshness) and limited articulation. 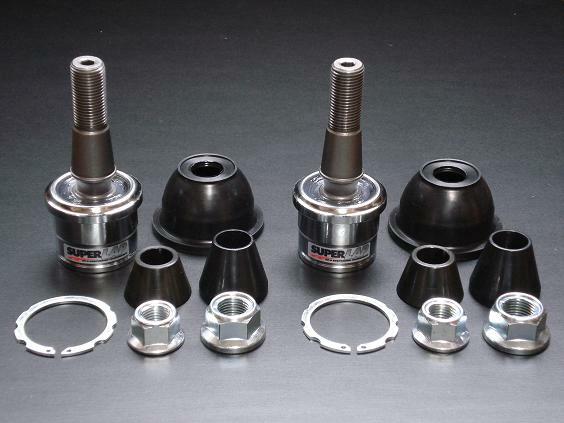 Since introducing these to the 350Z/G35 market, they have fast become the endlink to have for street and track use. However, it doesn’t stop there. Powergrids Porsche endlinks are now widely used throughout the PCA, as well as SCCA. GM’s Chevy Cobalt SS Teams have dominated the ST2 class using these links, and they have been prominently used throughout NASA, and other series. Any questions, drop us a line at z1sales@z1auto.com, or on AIM (z1auto, kwamez1auto) and we’ll be happy to assist you! We can offer a wide range of links from Audi to Volkswagon, and we’re always interested in developing more applications! With the winter months fast approaching, there is no better time to get that AWD car out in the snow and play. 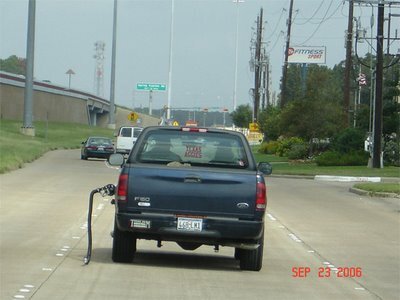 But with so much salt, ice, rocks on the road during this time, it can quickly do a number on your paint. Have no fear, RallyArmor is here! RallyArmor Installed on 2002-2007 WRX/STi - Click for More Info! So if you’ve got an Evo, WRX/STi, Impreza, Legacy, Forrester, Lancer, etc. and you want a set of these awesome flaps, give us a shout! Any car guy who lives and breathes loves a Ferrari. But what do you do when a rare, specialized sports car isn’t enough? Modding Ferrari’s isn’t exactly easy business. While there are a handful of “tuners” out there for these fine machines, how many of them have real racing credentials to back up the changes they propose? By now we’ve all seen the Garage Saurus twin turbo 550 Maranello on the internet, in various blogs and forums. This was a customer car built for a well-to-do client from the far east. A very impressive machine. But to say that it is JDM is a bit of a stretch IMHO, as it clearly draws inspiration from real racing use. Here we’ll look at a version of the 550 that I am sure was squarely in Garage Saurus’s sites when they were doing their Ferrari build. Has a very similar “feel” to the exterior. 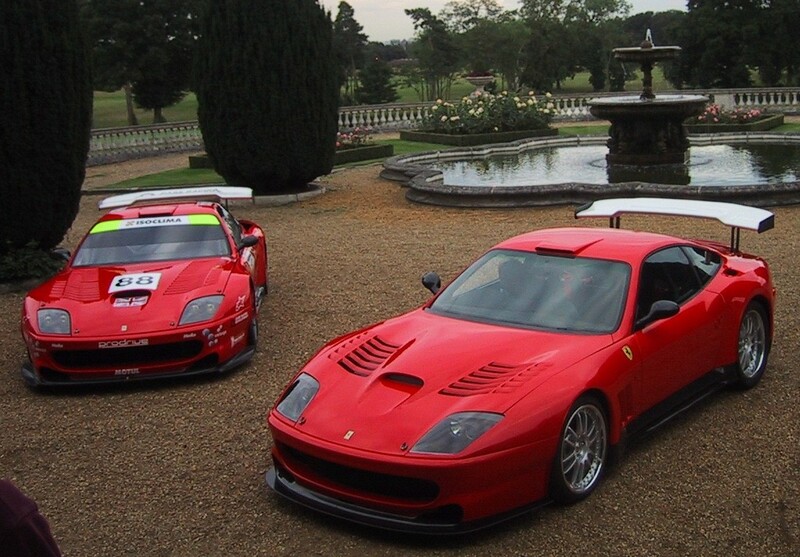 The 550LM was originally conceived by Care Racing and ES Motorsport to commemorate their GTS class victory in 2003. The car was developed in conjunction with Prodrive (yep, that Prodrive) who I guess had done all they could do with the Subaru’s and were looking for a new challenge (and a new client). The road car was developed based directly on the R&D done on the racing version. This is something you often see as part of marketing hype, but in this case, the hyper was well deserved. Upgrades included a 52hp bump courtesty of ecu and exhaust mods, full carbon fiber body, revised suspension, OZ wheels, LM derived aero kit, carbon/leather adjustable seats, and various other bits. This was designed to bring true LeMans feel to the road going 550. 0-60 clocked in at 3.9 seconds, and the car weighed a mere 3086 – not too shabby for a V12 powered GT machine (my Z is jealous and needs Trim Spa). In full race trim, the car checked in at just 2400 lbs- simple amazing! Here are some shots of the race spec version that I’ve found. This car has been campainged since 2002 in various configuration. It even has competed in the US in the ALMS series a few times. Among the drivers – Danica Patrick. At LeMans the car was driven by such legendary drivers as the late, great Colin McCrae. Pretty elite pedigree. I think you’ll agree, there is just something about a redhead. 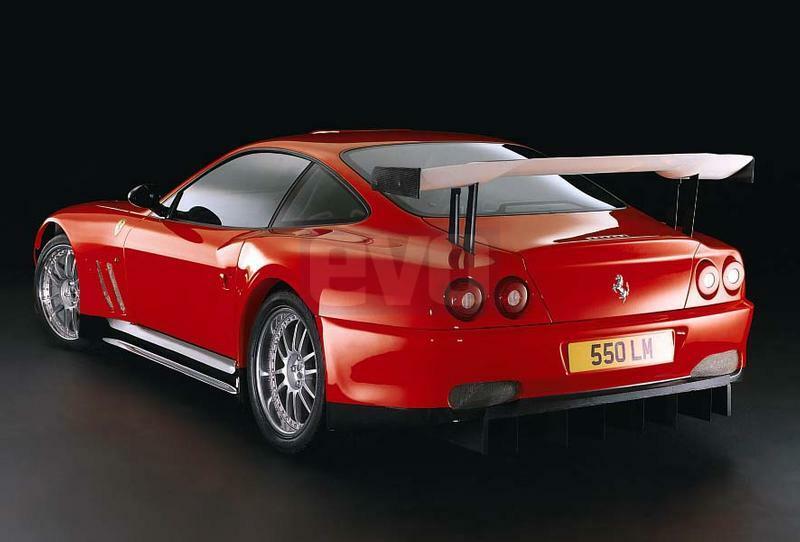 Ferrari thought so highly of this effort that they eventually developed their own version – the 575GTC. I’ll do a separate post on that machine, since I have a ton of pics and video saved. Adam sent me this video last week and all I could think about is how disgustingly quick the GTR is on the straight aways. I know it would be much faster in the turns too but the driver obviously isn’t pushing it, neither is the driver of the STi which is in pursuit. The GTR driver might as well have thrown up the deuce as he was outtie 5000 on that STI. personalities that they bring to the table when executing the build on a project. I can honestly say one of the nicest guys I’ve met in the 17 years I’ve been involved in this scene is Cheston Chiu. While we’ve never formally met in person, we’ve spent countless hours back and forth over the phone and IM, pm’s on the message boards, etc. He’s one of those guys who is no stranger to the game, which makes him easy to work with. He also is smart enough to know when to ask questions, resourceful enough to know how to discover the right answers. 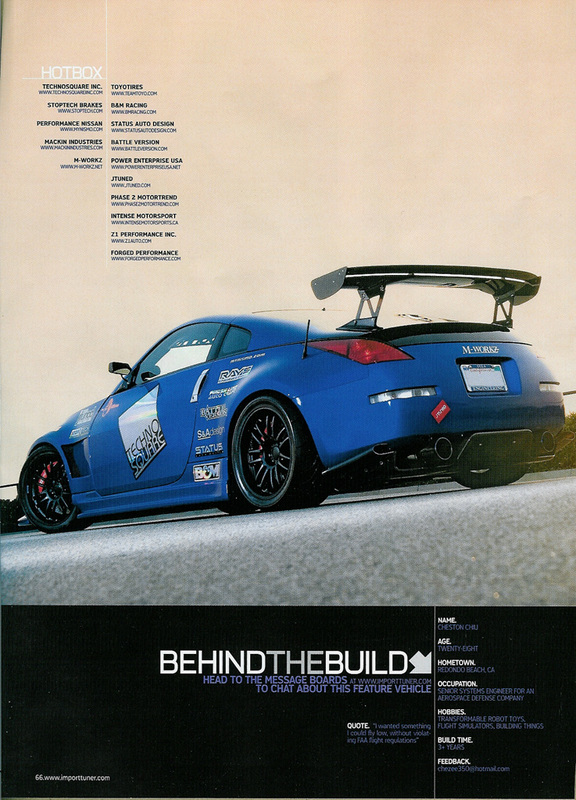 We’ve featured his car on our site before, and we’re proud to have been involved. What a pleasant surprise to find that not only was Cheston’s car entered into the Sport Compact Car Ultimate Street Car Challenge, but that he would be one of the featured cover cars! Congratulations are definitely in order to Cheston – a class act all the way, and someone we’re proud to be involved with. The car you see is the result of many long hours, many paychecks, and alot of love, dedication, blood sweat and tears. My favorite thing about the car is it’s ever evolving. We’ve know him since 2003. Since that time, we’ve seen alot of Z owners come and go. Cheston has stuck through it, and the net result is a very well executed, thoughtfully prepared machine that is balanced – something I can appreciate since it’s how I like to approach projects as well. Congrats one again Cheston and to all parties involved in the project! Lower the center of gravity. Change the suspension geometry that countless Japanese engineers (who also happen to be much smarter than you) had created for the car when it leaves the factory. When you lower a car, the distance between the center of gravity and the roll center increases, causing the roll stiffness to decrease, and voila you ended up inducing something you thought you were correcting – body roll. Sure you can mask this with stiffer springs and stiffer sway bars, but this is only a band-aid. If this is on your street car, stiffer springs also means a harsher ride. The Moonface Roll Center Adjuster will raise the roll center up (without affecting the ride height) and bring the suspension geometry back into factory spec. This decreases the distance between the center of gravity and the roll center and as a result, drum roll please … less body roll. Another byproduct of correcting the suspension geometry, is that you will increase turn-in speeds and reduce bumpsteer. Which if you don’t know … are good things. Are your engine hoses ready for battle? Well now with Samco’s help they will be, literally. This is Samco’s newest color, called “Camo.” It’s interesting to say the least. It’s currently available so if you are looking to pick up a set for your application, let us know (Adam – z1sales@z1auto.com, Kwame – Kwame@z1auto.com or Jonathan – Jonathan@z1auto.com). Leave your comments on what you think about this new color.